The offices will be provided as open plan shell and core. All landlord areas including the shared lift lobbies and stairwells where necessary will be fully decorated with all electrical and mechanical works finished. 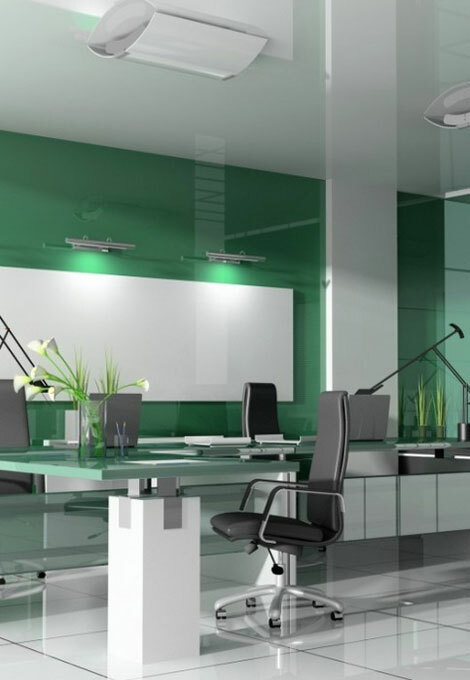 All final office fit out decoration electrical and mechanical installation inside the offices will be paid by the tenant however the work will be carried out by the landlord to ensure continuity of design. All different uses of the building will be separated with a mechanical floor. The office layouts vary in size, ranging from 630m2 gross area up to 760 m2. As the central lift core allows for a number of different tenant configurations. The floor plates can be subdivided into a number of tenants per floor with the inclusion of a shared lobby or can be used as a single tenant on a floor or as a tenant sharing a number of floors. A 450mm deep raised floor allows for electrical comms layout flexibility as well as providing the plenum for the office ventilation. As ventilation is run through the floor the ceiling void can be minimized to contain only the lighting layout and sprinklers. Offices are no greater than 10m deep. The shallow footprint maximizes the potential for natural daylighting and ventilation, satisfying the for criteria BREEAM. To view the architectural plans of the Offices click here.